On Thursday, the “Here Now – Re-Imagining New Lynn” event opened. The as yet unused retail spaces of the New Lynn Merchant Quarter were given over to projects by second-year students of the School of Architecture and Planning at Auckland University. Plenty of imagination was on offer and often brilliantly realised. I thought it was a success, particularly since it showed how the place can get a buzz with people milling about, and interacting – especially effective with the Thursday Night New Lynn Market held at the Community Centre next door. 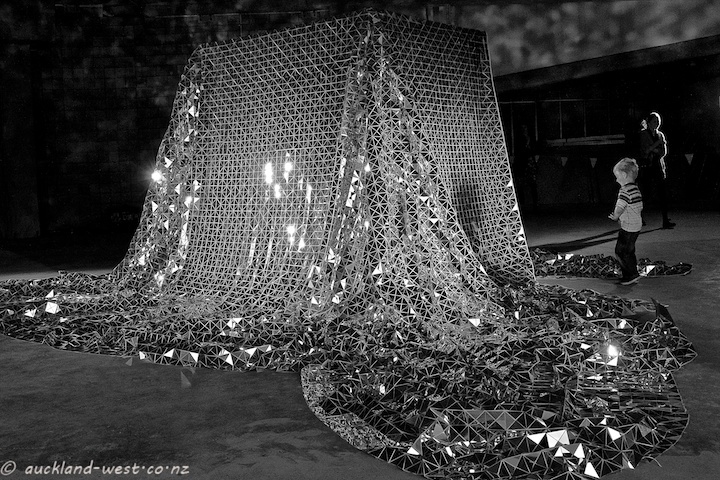 The installation shown here is entitled “Frame of Mind” by a group calling themselves “Helios“: fabric, covered painstakingly by reflecting perspex triangles, thrown over a scaffold, formed intriguing landscapes in the folds right down to the floor. Lights enhancing the effects, and signs inviting “Do Touch”. Inside, the structure has the same reflective nature, with a reddish tone, and of course glitter multiplied infinitely. One of my favorites of the event.